University of Missouri assistant professor Melissa Click. 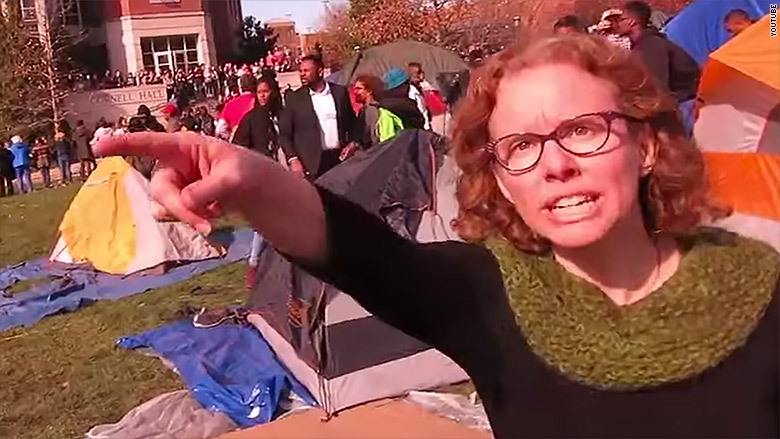 Police at the University of Missouri are determining whether to file charges against Melissa Click, the assistant professor who generated an uproar this week when she was filmed blocking media access to protests at the school. Major Scott Richardson told CNNMoney that the investigation remains "open and active." Mark Schierbecker, the University of Missouri student who filmed Click, filed a complaint against the professor on Wednesday alleging simple assault. In the video, Click, an assistant professor of mass media at the university's School of Communications, can be seen trying to grab Schierbecker's camera. "Who wants to help me get this reporter out of here?" she said in the clip. "I need some muscle over here." The interaction earned Click nationwide ridicule, with the photo of her confrontation with Schierbecker plastered across Twitter and dozens of news websites. Click apologized on Tuesday, expressing regret that her exchange with Scehierbecker had "shifted attention away" from the student-led protests over racism on the University of Missouri campus. Later that day, Click resigned her courtesy appointment with the university's prestigious School of Journalism. Click did not respond to CNNMoney's request for comment.